This project explains the features that you should be looking for in a self build plot. Everyone’s needs and aspirations are different so the choice of plot will be different; there will be compromises that you have to make and things that are more important to you. Much of your choice will depend on your budget, how you are going to complete your self-build, and the amount of risk you are comfortable taking. This project explains these tradeoffs and helps you to select the building plot that is right for you. There are, broadly speaking, three main elements which you have to deal with when you take on a selfbuild project; the building itself, the finances and the land or plot. The build element is relatively self-explanatory, in that this is about getting your new home built. You can mitigate the risk of things going wrong by using experienced professionals, project managers or doing your homework if you are going to be more involved. The financial element is essentially ensuring that you will have enough money to complete the project, whatever the ultimate cost actually is, regardless of what your initial budget is. We have a project to understand the lending options to help mitigate this risk. The final element is that of finding a suitable self-build plot, and this is probably one of the hardest things to achieve. There are two elements to this; firstly finding land, and then secondly ensuring that it is right for you. Much of the success of your project will come down to choosing the right bit of land for you. This is what this project is about. We will help you evaluate the options that you have and ensure that you pick the best one for you from the plots that you have found and are evaluating. With the Right to Build Scheme, the government have forced local authorities to make land available, which helps the search for a plot. We also review the best places to find suitable land to build on in our project all about finding a building plot – this project is more about the search than evaluating and selecting the right plot. There are a lots of options when it comes to choosing the right piece of land for you and your needs. There is effectively a range or continuum when it comes to building a new home. The more that the developer is involved the less design input that you have, however the less risk that you have to take on. 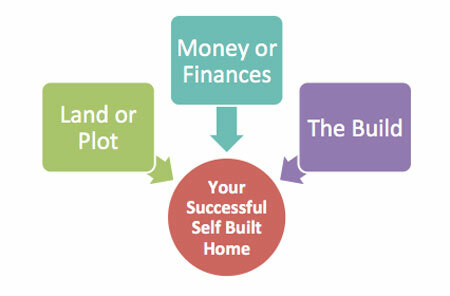 Many people believe that self building starts with a green field and you have to somehow get your home built on it. It can be this, but there are other options in between this extreme and the others where a developer builds a home and sells it to you. This is where the concepts of custom-built homes and service plots come into the mix. As a potential self-builder you know the benefits (and some of the risk), but if you want more about this have a look at our introduction to selfbuilding project. A new build that is built by a developer will not have your input during the build, and you’ll have to pay stamp duty and VAT. The attraction of self building is that you get to avoid these costs, while enjoying all the design freedom the planning regulations give you. A custom build is somewhere in the middle. A custom built project allows you to enjoy many of these benefits, but without the daunting challenge and risk of going it completely alone. The big attraction to this approach is that you have an experience developer on your side who will be able to make your project happen, while you still have the input that you want. As you move up the scale further towards the self build end, you are taking on more work, responsibility and risk. The benefit is that you will potentially have more control over the design and there might be significant savings if you manage the project well. They will typically have outline planning permission granted, and in some cases detailed planning. This allows you some freedom to design your own home without the risk that you’ll fall at the first hurdle and fail to get planning permission. Also the costs of getting services to an un-serviced plot can be prohibitively expensive. If you know that these are already available this is a significant risk to your project resolved before you even start. So far we have touched on the options that are available to self and custom builders when it comes to choosing land. If you know which of these you want before you start you can then ensure that you are looking for the right kind of plot from the outset. The relative risk levels plummet as you go down the list, particularly from Green Field Site to Services Plots. A plot without any form of planning is a big risk and might mean that you can never start your project. Once planning has been approved, the risk plateaus, as it is probably the biggest risk that any would be self builder faces; without planning the project cannot proceed. Most other factors tend to translate into higher cost which may or may not stop the project being viable, but they are not a flat “no”. There is a premium paid for land with planning granted, as this is removes a huge risk to your project. It is well worth employing a planning consultant to assist you with your planning application or to advise you about a plot before you purchase as this could save you a lot of time and money in the long run. Even if you do not want to employ a planning consultant, we recommend a call to your local planning office before you make a purchase on any land that does not have planning granted. While they will not be able to advise you specifically they will be able to discuss the rules that they work to which will give you an indication of what it feasible and achievable. Buying a large area of land for development need not be limited to those who run large building companies. Getting a group of like minded self builders together and sharing in the cost of a large building plot can considerably reduce the cost of an individual home. By working as a group you will have a lot more clout to get things done and not only to share the costs. Working together with you future neighbours will be a bonding experience that should bring the community together before it’s even built. You can find out more about Community Self Builds at the Cohousing Network or even the Community Self Build Agency. We have covered in detail the two biggest factors that you should consider; getting planning approval and getting services to the plot. These will feature highly in your search, but when you have found the land, or have a short list of plots, there are a number of other things to consider when evaluating them. You will be very fortunate if you find a flat plot of land, devoid of trees, easy access and with all services conveniently located for connection. There are many considerations when you find a plot and we have outlined below some things to look out for. Just because we are listing them doesn’t mean that any will necessarily pose a problem, but we hope we have pointed you in the right direction to determine your course of action before making your mind up. It is important that you like the plot and can see yourself building a beautiful home there as well as these more mundane factors! This project should help you understand the different types of self build plot that are available and what factors you should consider when choosing the right one for you.